While I could say that Song of the Summer King by Jess E. Owen is a very satisfying action adventure young adult book played straight (which is true; it follows a coming of age story formula and it knows it), there's a lot of subtle choices made by the writer which makes this book stand out: how inaction is in itself implicit action; how listening can appear to be a prophetic power to those who have never attempted empathy; how refusing to choose between two bad options can be a valid choice. From the beginning of the novel, Shard lives passively: he's enthralled by a patriarchal society of fascist conqueror griffins who believe only the strongest survive. He lives in constant (well-founded) fear of never being trusted and eventual exile, which are his driving influences to seek strength and social accolades. But when Shard's own heritage gets foisted upon him, he has to choose between being comfortable or being ethically consistent with what he finds to be the truth, all the while reconciling his racial differences from the dominant griffin tribe. Shard has to question everything when he discovers that the world is more complicated than he once thought, and that it is incredibly frustrating when those closest to him continue to live trapped in their oversimplifications about what it means to live a good life. Spoiler warning: This review does discuss plot elements some may consider spoilers below the break. Five Elements Press, 2012, $4.99 Kindle, $25 hardcover, $12.99 paperback (264 pages). Illustrated by Jennifer Miller. Many questions get provoked implicitly and explicitly: why do men make the most important decisions in situations where women contribute more? Is there true power behind a leader when they make endlessly poor decisions and their followers suffer? Do those who appear most powerful truly have as much power as they imply? Should short-term comfort be sacrificed for long-term societal good? Is family more important than morals? What makes a family? How does racial division open and close doorways of opportunity? How does implicitly enforced heterosexuality affect lives in a society bent on colonizing and conquering? How can one properly answer conflict with conflict when its origin can't be discerned any longer? How do we survive and cope with living under a government we vehemently oppose? A decent amount of genre subversion occurs too. 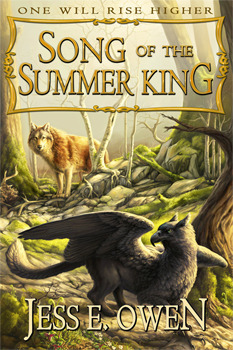 Song of the Summer King asks a lot of big, thought-provoking questions in the garb of a fast-paced adventure novel whose atmospheric landscapes are lovingly and artfully sculpted. It's a strong piece of genre fiction that unabashedly and unashamedly honors its predecessors. One criticism (which is the big spoiler) might be that the book went in directions it did not need to go. Shard didn't need to be a crown prince to make any of the decisions that he did. Monarchy itself isn't criticized as a form of government despite crown leaders being consistently bad news. There is also a notable absence of characters who are truly frail in this universe, and much of the book's themes and events imply that relying on different strengths than physical ones aren't enough; if you are weak physically you will not survive. Fortitude is the base line for survival. But this is just the first book in this series, and it's possible that sickly characters who can make an impact still come into play later. There are a few typos in the version I read, but I suspect these will disappear in future prints, which makes me believe I will own a treasure in the coming years.